Like many non-profit organizations in the territory, Lighthouse Mission is having a hard time getting back on its feet after the September hurricanes. But 75 volunteers from Vermont are putting a dent in the mission’s recovery efforts this week and helping several local churches as well. The adult and teen volunteers are visiting for nine days from Christ Memorial Church in Williston, Vermont. Two congregations and the volunteers themselves raised funds for the trip. “Everyone in the States watched Irma and Maria come through. We wondered what we could do to help. We knew the churches would be affected on the island,” said pastor Brad Parker, the group’s leader. For a week, the group has worked long days, gathering at night at the Sunny Isle Baptist Church to eat, sleep and study the Bible. They brought their own cook, borrowed 75 cots from the Boy Scouts, and divide up cleanup duties, according to Parker. Each morning, work crews led by volunteers with construction experience, deploy to five locations for the day. 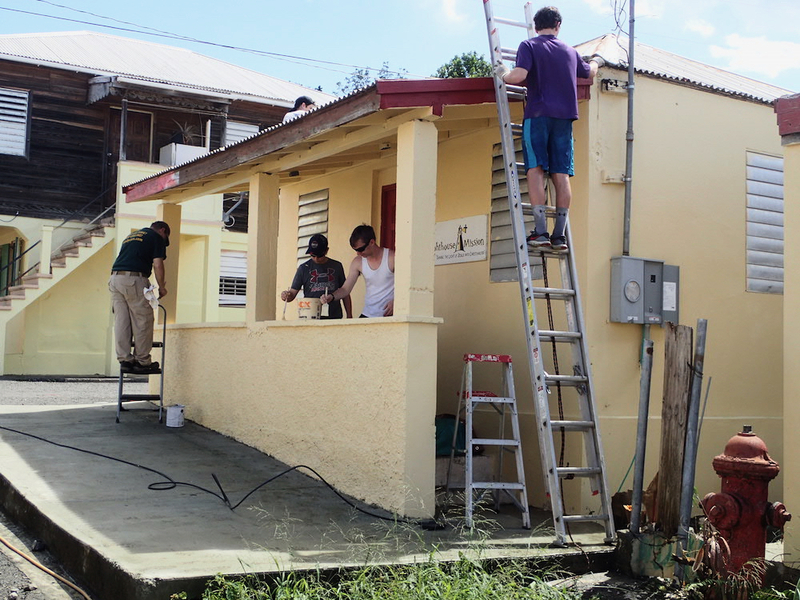 In addition to working on the Lighthouse Mission and its education center at Southgate Baptist, the group is painting, cleaning, sprucing up landscapes and repairing roofs at the four Baptist churches on St. Croix. “We’ve just been having a blast,” Parker said. The Lighthouse Mission is on the fringe of Sunday Market Square in downtown Christiansted. Although it is owned by the Southgate Baptist Church, Debbie Cullen, director, says they partner with other organizations – religious and secular – to provide services for the needy and homeless. 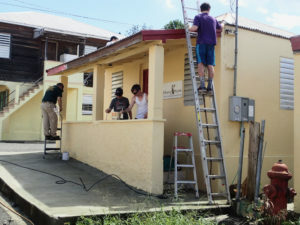 Hurricane Maria caused water damage to the Mission and knocked over the fence, leaving the building vulnerable to thieves. The loss of electricity caused all of the food in the freezer to spoil. Before having power restored Thanksgiving week, the Mission depended on a generator donated by Cane Bay Cares to feed the needy. Right after the storm, people were looking not only for food, but also clothes and toiletries, Cullen said. Christ Memorial Church is a member of Converge Worldwide, a coalition of Baptist churches. Parker said they take a trip every year to help in churches various locations around the country and every third year travel internationally. In the past, the group has traveled to Estonia, Cameroon, and Wales. Eighth grader Patrick Mellmann is one of the volunteers visiting St. Croix for the first time. He said he knew what to expect because he has visited the Caribbean to scuba dive. St. Croix is different, he said, because of the overwhelming hospitality he has encountered. The volunteer group is scheduled to host a family fun night at Sunny Isle Baptist at 6:30 p.m. Friday with live music, games, food and a bible presentation. Parker said the community is invited.